10″ high rear wheels easily glide through tall, thick grass. Change the height-of-cut with easy-to-use adjustment handles. Select the ideal cutting height for your lawn. Rear-wheel drive improves walk-behind mower traction. 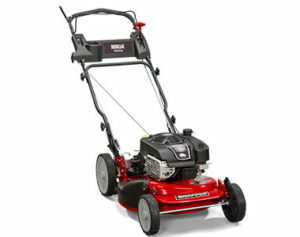 The smooth-turn differential helps ensure easy maneuverability without damaging your grass. Snapper’s proven disc drive transmission is a dependable speed adjustment system. Its higher wheel torque and control provides improved speed control on hills and helps pull through thick grass or rough terrain. The Briggs & Stratton Professional Series™ OHV Engine combines professional-grade power and performance with homeowner-friendly ease-of-use. Strong, quiet and durable, this engine comes standard with the ReadyStart® starting system: No priming. No choking. Just pull and go.